In early 2011, Sophie King had a problem. Floating in her mind was the image of the perfect hair accessory: delicate feathers, hand painted to form a single butterfly. Why was this a problem? Because such a thing just didn't exist! Well, they say that if you want a job done well you should do it yourself, and that's exactly what Sophie did. 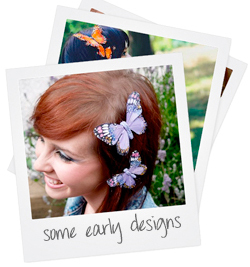 The result of that first spontaneous project was Crown and Glory, which in the time since the first collection of assorted, hand painted butterfly pieces hit the internet has expanded into an international fashion accessories brand that boasts fans such as Poppy Delevigne, Millie Mackintoshand Rosie Fortescue, popstrels Gabrielle Aplin, Amelia Lilyand Little Mix and more fashion bloggers than you canshake a stick at. 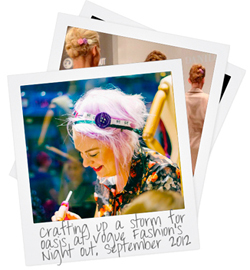 In 2012, Sophie and her lilac locks were hired by high street fashion chain Oasis to custom make headbands for excited punters at their party for Vogue's Fashion Night Out (staged in a window display on Oxford Street, no less) and accessorised the collection of Italian designer Danilo Gabrielli for his SS'13 collection at London Fashion Week. 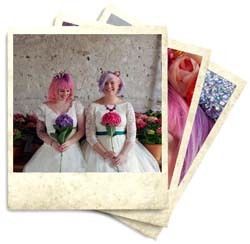 In Summer 2013, Crown and Glory teamed up with queen of alt weddings, Kat Williams of Rock n Roll Bride, to create a range of alternative bridal hair accessories, for girls who believe that life’s too short to wear the sartorial equivalent of a potato sack and that accessories maketh the outfit. In 2014, due to popular demand, they released a collection of accessories for bridesmaids, and introduced new product lines - belts and cuffs - into their repertoire. In 2014, Crown and Glory introduced the worlds’ first headpiece subscription box - The Glitterati. With hundreds of subscribers across 3 continents, Crown and Glory deliver off the hook hair things to Glitterati members every month, including exclusive designs and first looks. 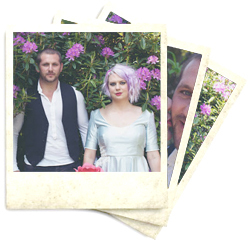 These days, Sophie is joined by her partner in crime Gareth, who spends his days being the only glitter-covered, rugby-playing, hair accessory production manager in the UK (probably) Together they design and manufacture Crown and Glory's cute-as a button animal ears, loud and proud floral crowns and more sparkly bows than you can shake a stick at from their cosy Cornish studio. Read more about our roles here.